Just like human hair, the hair on dogs gets dirty or contracts lice or sheds or the skin gets itchy. Watching your dog suffer from the itchy skin is enough to make any pet owner distraught and frustrated. These feelings can be made even worse if you’ve tried remedies that haven’t worked or, worse, irritated your dog more than it helped them. If this issue is new for your dog or something you’ve been battling with for a while you should first try to understand what is happening to your dog, why it’s happening, and how to help them immediately and in the long run. Not only will this helpful guide teach you about your dog’s skin, it will also help you find great products that you can use for them, specifically the best shampoo for itchy skin. One way to help your dog is to use Dog shampoos specially formulated for itchy skin. This dog shampoo is a special formulation of shampoo that can be used safely on a dog’s skin and fur. Human shampoo cannot be used on dogs since our shampoos are harsher and may cause damage to dogs. An important factor here is the pH of the shampoo which is very different for humans and dogs. Disrupting the pH level may cause a number of allergies and diseases in animals. Your dog may be itching for a variety of reasons. The pool of possible culprits goes beyond 500. There are a lot of reasons why your dog might be suffering from itchy skin. They could be dealing with a biological issue, an environmental issue, or a combination of both. It’s always best to get to the root of the problem before you begin treating it arbitrarily. If you can, visit a vet or at least a groomer to try and figure out why your dog is scratching so much. Let us look at the common reasons. It is essential that you find out why your dog is itching so that you can cure the actual problem and prevent the same problem from turning up again. If you visit your vet, they’ll most likely evaluate your dog for allergies. Your dog could be developing itchy skin from an allergy to the foods they’re eating or from things around your home including detergents you use on your clothes, home cleaning products, or from a shampoo or conditioner you used on them. Something uncontrollable like the natural humidity of your local climate can even cause your dog to develop itchy skin. Your vet will be able to determine this easily with a thorough evaluation of your pup. Once you find out the cause of your dog’s itchy skin, you can figure out the best way to treat it. For example, if you find out that your dog was simply allergic to a harsh shampoo, switching to a hypoallergenic dog shampoo or one made for sensitive skin can help alleviate the problem. Similarly, if you find out that your dog has a food allergy, like sensitivity to wheat or corn, changing their food can help make them feel better. An overall lack of nutrients might be contributing to your dog’s itchy skin, too. This can also be remedied by a diet change. It is important to have your dog evaluated by a vet to determine why they’re itchy because it could be something more serious like a parasitic infection or a skin disease. If this type of issue isn’t resolved properly and quickly, it can cause major health problems for your pup. So, don’t take itchy skin lightly; talk to your vet and make sure there are no serious problems with your furry friend. While you are finding of the disease, you can do a number of other things to ease the itch. Bathe your dog in cool water to relieve the itch. Hot or warm water will make it worse. You can add additives like baking soda, Epsom salts or colloidal oatmeal into that water. If you believe that an anti-itch shampoo is enough to help treat your dog’s itchy skin, you need to buy the best one available that fits your needs. With so many options out there, choosing the right one can be difficult. To help you do this, some of the best shampoos for itchy skin have been researched and reviewed analyzing the pros and cons of each as well as what makes them the top shampoos on the market. Wet coat and apply thoroughly, rinse well. Spray affected area thoroughly and evenly until wet, Apply twice a day for 1 week. Helps biting licking and scratching, Soothes hot spots and dry skin. Apply on wet coat to make lather, keep for a few minutes and then rinse thoroughlt. Anti-fungal, anti-bacterial, antiseptic and anti-pest shampoo. Apply on wet coat, 1.5 tbs per 5 lbs of pet weight. Keep for 3-5 min. Apply once a week. Here are quick reviews of some of the best shampoos for your dog. Fatty acids can add additional nourishment and hydration to your dog’s skin. This can dramatically reduce itchiness that might be caused by dietary issues. 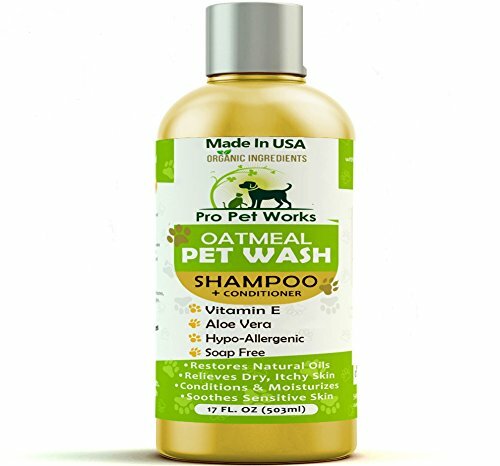 This shampoo has a unique formula packed with vitamins and nutrients that will nourish your pup and also help control flaking, dry skin caused by skin problems like seborrhea. 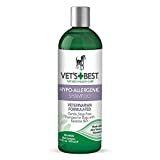 This shampoo will also rid your dog of dirt and debris including pollen, other allergens, and even pests without damaging their skin or throwing off their pH level. There is no soap in the formula making it great for sensitive skin. It not only helps relieve itchy skin but can also help heal rashes according to reports. The top selling shampoo at the moment, this organic product comes highly recommended by users as well as vets. It can alleviate skin problems and also condition your dog’s coat leaving it clean, irritation-free, soft, and shiny. It’s even great for helping sooth flea bites and allergic reactions. There are no harsh ingredients in the formula including alcohol, artificial colors, sulfates or perfumes. Instead, natural ingredients specifically used to soothe itchy skin are used to create the shampoo. It also uses aloe vera and essential oils to calm irritation on your pup. 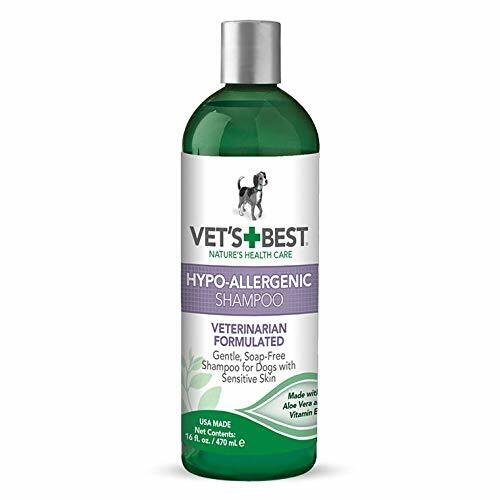 If your furry friend suffers from allergies, this hypoallergenic shampoo can help relieve their itchy skin and keep them clean. Its moisturizing formula is soap-free and contains aloe vera as well as nourishing vitamin A. It will also condition your dog’s coat leaving it smooth and soft. This is also dermatologically tested so you know it’s effective and safe for your pet. It won’t cause their eyes to burn and won’t worsen the irritation. The formula is safe to use with other products including topical flea and tick treatments, too. If your dog has itchy skin because of a flea or tick infestation this shampoo is a great option. It kills the parasites on contact and will repel future infestations. This formula is also good for killing and repelling lice. While this isn’t an all-natural product it does have coconut conditioners in it to nourish your dog’s skin and coat to keep the itchiness at bay while also making their fur soft and shiny. There are specific instructions that need to be followed in order to make sure that the product is effective. This includes measuring out the proper amount based on your dog’s weight. Since the formula is a bit strong, it’s recommended to use on dogs over 12 weeks old so it can’t be used on young puppies. 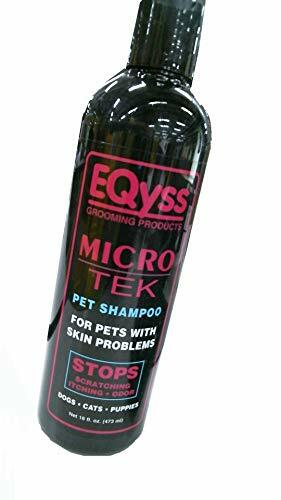 This is a product of EQyss Grooming Products. It is made using a special formula that is non-toxic, fast-acting and cures itching instantly. This shampoo is ideal to cure seborrhoea, ringworm and hot spots. It is also advertised that this shampoo is effective against viral, bacterial and fungal conditions of the skin. Seborrhea is often a cause for itchiness in dogs. You should consult a vet so that you understand what your dog is going through before shampooing him or her with this product. This shampoo fights itchiness and hot spots by using wheat germ oil, hydrocortisone, and lidocaine. These compounds are safer than formaldehyde containing shampoos. This shampoo also has colloidal oatmeal and aloe vera which soothe and moisturize the region. The previously mentioned compounds reduce the inflammation of the itched area. It prevents your dog from chewing and gnawing through its soothing formula. How Can Dog Shampoos Help in Case of Itching? How Frequently & for How Long Can You Use Anti-itch Shampoos on Dogs? Can Chemicals in Anti-itch Shampoos Harm a Dog’s Skin? Organic Dog Shampoo for Itchy Skin – Are they Good? Can You Use Spray for Dogs with Itchy Skin? Special shampoos that contain certain chemicals that attack the cause of the itch can also help to reduce or remove itching. For example, the yeast infection can be cured by using a shampoo with selenium. Some people also report that shampoos that contain oatmeal help greatly. You should ensure that you do not bathe the dog too much. Dermagic shampoos, which contain sulphur, have also proved to be useful. Hydrocortisone in the shampoo helps to cure itches due to minor scratches. Sulfodene also cures minor itches. For mild cases of dermatitis and dry skin, a gentle shampoo for curing itches is preferred, especially the ones that contain oatmeal. If you use shampoos with harsh chemicals, then the dog’s skin will get drier and itch more. Tea tree oil and aloe vera in the shampoo is also a good idea since it reduces inflammation that arises from scratching too much. You need to make your dog reduce scratching since too much scratching leads to bacteria affecting the sore spots. If your dog is scratching due to dandruff, you can use shampoos that have lavender or rosemary oils. Once you determine what is causing your dog’s itchy skin, you can begin treating it properly. This treatment will usually include switching to a dog shampoo specifically made for soothing itchy skin. Always take your dog’s individual needs into account when choosing a shampoo, but in general, there are certain things you should look for and certain things to avoid when looking for the best shampoo for itchy skin. If given the choice between a chemical and a natural ingredient, you’d more than likely pick the natural ingredient. When looking for a dog shampoo, use the same logic. Natural ingredients have beneficial properties and are less likely to cause adverse reactions when compared to chemical ingredients that can strip away your dog’s natural oils and irritate their skin . Look for shampoos that use essential oils like tea tree oil, lavender, eucalyptus, or evening primrose oil. These are all natural ingredients that can soothe itchy skin as well as fight back against bacteria and infections. Besides having antifungal and antibacterial properties in them, these oils smell great, too. Similarly, these oils—especially lavender—have a calming effect that can help your dog relax. In general, ingredients that provide nourishment and moisturizing effects are best for dogs with itchy skin. Since one of the most common causes of itchy skin is a lack of moisture in the skin, using a shampoo with additional moisturizers will more than likely alleviate the problem with continuous use . Some medicated shampoos made for treating itchy skin are evaluated by vets for their safety and effectiveness. They’re usually only available through a prescription from your vet or they can be ordered online. These products are made specifically to treat certain issues like dry skin caused by a parasite or dry skin linked to contact dermatitis. Since they’re developed for specific reasons, they’re less likely to cause similar irritations, too. Dermatological testing done on the formula will also ensure that the product will work the way it should and that it’s safe for use on your furry friend. As you can imagine, dog shampoos can come in a variety of different formulas made for different reasons. Knowing the difference between each can help you pick out the best shampoo for you and your dog. In most cases, a dog with sensitive skin will be prone to rashes, scratch excessively, have red skin, and grow a dull, brittle coat . They can be suffering from internal or environmental allergies or they’re skin just gets irritated due to a lack of moisture. Choosing a shampoo made specifically for dogs with sensitive skin can help add hydration back into their skin and help keep irritation at bay. Sensitive skin shampoos have natural ingredients to lower the risk of irritation and will contain ingredients with soothing, hydrating properties. Essential oils, oatmeal, and aloe vera are some common things used in these formulas. You won’t find things like alcohol, parabens, or perfumes as these can alter your dog’s natural pH levels and cause more itching and similar issues. Besides excessive scratching, you may notice dry skin or dandruff flakes on your pup. Flaking skin can be caused by different things including serious infections and skin disorders. You should visit a groomer or your vet to properly take care of this since untreated medical issues can lead to more serious health issues. Shampoos made to deal with dry, flaky skin should contain moisturizing ingredients but you should also look for formulas that use fatty acids in them. These will nourish your dog’s skin and hydrate it while also helping their coat look shiny and feel soft again. The added nourishment will repair the skin and stop it from flaking off, too. Again, look for natural and organic formulas to lower the risk of irritation. While dry skin is most related to itchiness, dogs with oily skin can also present with excessive scratching. Similarly, they also tend to be a little smellier than dogs with dry or balanced skin . For this reason alone, these dogs require more baths than other dogs. In order to properly care for a dog with oily skin, you need a shampoo formulated for oily skin. Like others, look for natural ingredients. This isn’t just about their effectiveness, but also about the safety of natural products. Since dogs with oily skin need more frequent baths it’s imperative that the shampoo be safe for frequent use. Most chemical formulas fail to meet this criterion, but natural and organic products are usually safer to use often. Specifically, oily skin formulas usually contain some type of citrus oil or ingredients like orange peel. This is because these ingredients can cut through your dog’s body oils to eliminate odors without drying out their skin too much . The ingredients should also balance out their pH levels in order to stop the overproduction of oil in your dog’s body. Tea tree oil is known for naturally doing this. These are unique shampoos that don’t need to be used with water in order to clean your pup. They can come is sprays, powders, or even clays. All you have to do is apply the shampoo to your dog and make sure it’s spread evenly throughout their coat. Every shampoo will have its own instructions but the common theme here is that you don’t need to lather up your dog and rinse them off, though most will usually tell you to brush your dog afterward in order to avoid any buildup on their skin which can lead to irritation. Waterless formulas are great for dogs who get scared by water but are also great for dogs with itchy skin. This is because they can be used in between normal baths with other shampoos. If you need to frequently bathe your dog but have a pet who puts up a fight whenever bath time rolls around, you can care for them properly without putting them through the torture of a normal bath by using waterless formulas as an alternative. Similarly, if it’s winter and you’re concerned about it being too cold to bathe your dog, these shampoos can get the job done without water. Look for natural ingredients that won’t irritate your dog’s skin. This is important because the dry shampoo will lie on your dog’s coat and skin instead of being rinsed off like normal shampoos. In case of sensitive dogs, this can lead to irritation. By sticking to natural ingredients you can lower this risk of irritation. 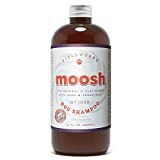 That being said, if your dog does have allergies or sensitive skin, you might want to steer clear of this type of shampoo. Not only does it not rinse off, it can leave behind a greasy residue that can attract dirt and debris which can lead to irritation and further itching. In most instances, your vet will tell you how often to use a prescription anti-itch shampoo. Similarly, most shampoos will have their own recommendations on how often you should use the product. For example, some shampoos might tell you to use it two times a week to clear up flaking skin or your vet might tell you to bath your dog once a week to keep debris from irritating their skin. Common sense says to always follow a product’s instructions or your vet’s instructions when it comes to anti-itch shampoo. If your dog has allergies, you might need to bathe them more often than you would other pups. Dogs with skin problems may need the nourishment from a shampoo to help them stay in good shape. More serious conditions might require frequent use of a medicated shampoo to keep a bacterial infection in check, too. In general, natural shampoos can be used continuously without much of an issue. The best thing to do is to see how your dog reacts. If you see that the natural anti-itch shampoo can continue to be used even after the initial issue is cleared up, use it how you like. However, medicated shampoos, especially those you get through a prescription will probably come with a cut-off date for use. For example, your vet might tell you to stop using it once the problem clears up or that you should use it two times a week for a month and then only once a week or every two weeks. Follow any recommendations when it comes to these types of shampoos. Anything can cause an adverse reaction in your pet, so you have to be diligent with the anti-itch shampoos you use. In most cases, natural ingredients are less likely to do harm to your dog’s skin than synthetic formulas. Chemicals in dog shampoos can cause irritation and aggravate any skin conditions your dog already has including itchy skin. This is truer for dogs with allergies who tend to be more sensitive. The chemicals can cause irritation on contact but the residue the product leaves behind can also cause problems even after thoroughly rinsing them off your pup. All that being said, every dog is different and what might damage one dog’s skin might not do so to another. Always monitor your dog when using a new shampoo (or any other product) and see if it is causing them harm. If you notice problems, discontinue use and switch to something they can tolerate better. Oatmeal has been used in skin protects since ancient times in early civilizations including Ancient Egypt, Greece, and Rome. Colloidal oatmeal is the type of oatmeal that dog shampoos and other beauty products use. This is oatmeal that is pulverized into a powder in order to make pastes or to add to shampoos. It’s used as a skin soother thanks to the avenanthramides and phenols in the grain. These are naturally occurring chemicals in the oatmeal that relieve itching and irritation. Oatmeal is also known to balance pH levels naturally which can relieve biological problems like seborrheic dermatitis. For dogs, oatmeal shampoos can relieve itchiness, add moisture back into the skin, and also clean dirt and debris off their skin while softening their coat. These types of dog shampoos are made of all-natural ingredients and are completely free of chemical additives including dyes and preservatives . If they’re certified organic by a governing agency like the FDA they can’t be processed with solvents, genetic engineering, or irradiation, either—processes that shampoos are known to use . Minimal processing is allowed to create the final product as long as everything used fits the parameters of a certified-organic product. Organic dog shampoos tend to be gentle and have a decreased chance of causing irritation. The natural ingredients will have properties to relieve itchy skin, too. These ingredients can be oatmeal, essential oils, aloe vera, or similar natural ingredients. As long as your dog doesn’t have an allergy to any of the natural ingredients organic dog shampoos can be the better option for sensitive dogs who need relief from itchy skin. If you’ve been shopping for dog shampoos you might have noticed dry shampoo sprays or waterless shampoos. These are a variety of shampoo that works without water. Instead of lathering up your pup like you would with a normal shampoo, here you simply spray the shampoo onto your dog and spread it throughout its coat to clean them and relieve their itchy skin. In most cases, you’ll be told to brush your dog so avoid residue or buildup on their skin. These dry shampoos are great if you have a dog that is afraid of water or puts up a fight during bath time. It’s also a great alternative to use between baths if your dog gets a little messy but not enough to constitute an additional bath. You can find natural and organic sprays as well as synthetic formulas . These can have ingredients that will naturally relieve itchy skin including essential oils. They tend to be gentle on your pup’s skin when compared to chemically-based sprays. You have to use caution when using a spray shampoo, though. If your dog is overly sensitive and reacts poorly, this type of shampoo can make their itchy skin worse. This is because you don’t rinse off the shampoo. Instead, the spray lies on the dog’s skin where it can cause irritation and leave residue behind. More so, these sprays tend to leave your pup’s coat greasy. This can attract dirt, dust, and debris which can also further irritate your dog and make their itchy skin worse. If you have a puppy, you might want to stick to shampoos specifically formulated for puppies or at least pick one that says it’s safe for puppies. This is because young pups have sensitive skin which can react poorly to harsh or strong formulas. Puppy shampoos are generally gentle yet will still get your dog clean. In fact, most won’t hurt burn your puppy’s eyes during bath time. Specially formulated shampoos can also help clear up itchy skin, too. You might have a hard time finding an anti-itch puppy shampoo, but more sensitive skin formulas are safe for puppies due to their mild nature. Similarly, organic shampoos are usually a safe option for puppies due to the lack of synthetic ingredients. As you can see, there is no shortage of anti-itch dog shampoos on the market. While such an array of options might be confusing when you’re looking for an effective product for your pet, the variety of products means that you’re guaranteed to find something that fits your needs and preferences. Always keep your dog’s individual needs and health in mind especially if you know they’re allergic to certain things. If you’re still unsure about finding the best shampoo for itchy skin, talk to your vet and see what they recommend. When it comes to using shampoos to relieve itching in dogs, we recommend that you consult a vet.